Bilge alarm Install--know if you've had a blowout! 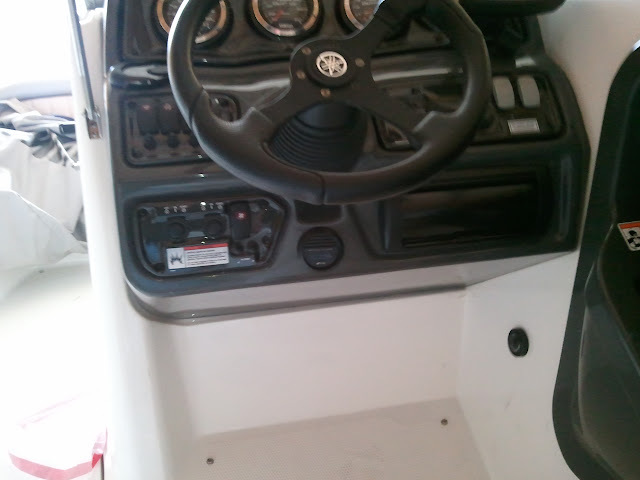 The install is pretty easy.....but does require you to drill holes in your boat! 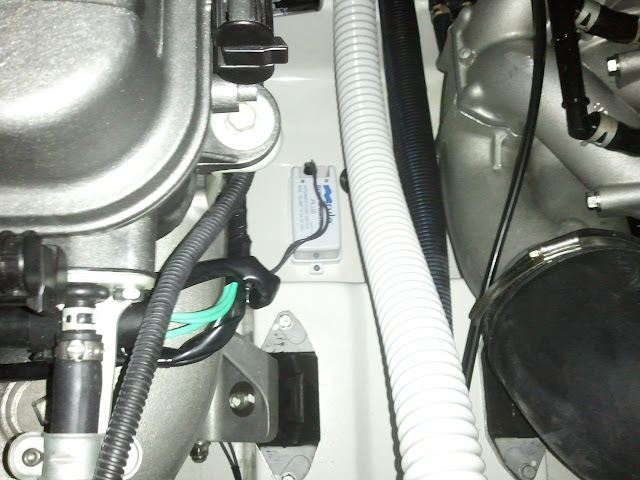 I mounted the alarm right next to the current bilge pump and ran wires to the battery. Then I drilled a hole for the alarm right in front of the binnacles as the fume detector already took the available space on my dash. You can see the black disk in front of the binnacle and behind the safety cable. How much was it? And what type did you install? Rule A Matic Plus it looks like, but is there a part number? Placement of the float was based on the idea that I want there to be enough water in there that I'm not getting a false alarm. If that thing goes off, it's real. Not to mention that I hate trying to get to the back of the engine compartment. I almost put my buzzer where Julian did, but then I looked around a little more and I opted to put the buzzer under the steering wheel. I figured it was a good spot since you don't have to see it, you just need to hear it. Lots of reports of these failing on Amazon (the switches only). Do you test it periodically? How? Dump in some water? Interesting....I've not heard of them having a problem with failing! I tested when I installed it, and I have to say I've not tested it since then and I should! At the time, I just threw a towel in to make a small dam to stop water from draining and used a hose to fill it up until the alarm went off. I should add testing it once in a while to my checklist. I do use a lighter to test my fume detector. You don't really need to add water to test them. If you look at Julian's picture real close, just to the left of where the wires go in, you'll see a slot with a tab sticking out of it. If you press down on that tab with your finger, the float will lift up. This should cause the buzzer to sound. If it doesn't, it isn't working. I do this as a mater of course every time I'm about to start the engines at the ramp. You all DO open the engine bay and stick your head in there to check for fumes right? Hint: You should even with the blowers on. As long as I'm in there, I just reach down and push the button. That switch will make it easier to test! I do the same as biglar155, I test it in prelaunch checks. Funny note-- the only time it went off was one day when we tried to outrun a summer t-storm. We ended up running straight into a really bad cell! So bad that you could not see more than 50 feet. Lightning was striking all around and my lovely wife grabbed the life vests and started to panic! It rained so hard that my bilge between the motors filled and sounded the alarm to add to such a dramatic event. By the time the rain let up we were 500 feet off course and facing the opposite direction....glad there wasn't any other vessels near us! @Julian @Murf'n'surf @biglar155 - Is the length of the wiring for both the battery connections and the Audible alarm long enough to reach their respective locations? Did you wire it directlty to the battery or did you go to a termination block with fuses? My wires were not long enough for either, I had to extend them with 18awg wire. My alarm is wired straight to the battery with an inline fuse near the battery. I wanted the alarm to sound if I had the boat turned off and in a wet slip. Thanks Murf. Can you provide a link to a similar in-line fuse setup? I have been thinking about putting a block in for distribution, but not sure if I will or not. what kind of drill bits are you using for the buzzer and the screws on the switch? Are they diamond tipped or some other type of drill bit? Not sure i fully understand your question @Betik , if you are asking about how I installed the buzzer in the boat....I bought a hole saw set that included an 2 and 1/8 inch hole saw. This may be a dumb question but what would prevent you from using a $20 home depot battery powered one designed to put below your hot water tank. You could velcro/double tape it in place. They are loud enough. Cam. PS thats $20 CAD which is $10 at HD US. you re right I should have been more descriptive. So generally speaking when you are making holes, is the hole saw ( I often incorrectly refer to it as drill bit) of a specific type or just a plain hole saw. For example, I thinking to use a diamond tip one, to ensure that to chipping occurs ( see attached picture). In terms of the alarm switch itself, didn't you drill holes before screwing it in place? I am thinking that if I where to put the screws directly it might stress and maybe crack the fiberglass. @Betik a standard hole saw works fine. I recommend drilling a pilot hole the same size as the pilot bit in your hole saw. Then run the hole saw in reverse slowly to score the gel coat. After the gel coat is scored, you can drill it out and you should be good to go. Also, using blue painters tape makes marking the hole easier and seems to prevent additional chipping. I have Bosch and Milwaukee Bi-Metal hole saws, and they both work fine.